View our list below. If you know of any programs in Wichita please contribute by Adding a New Listing Here. 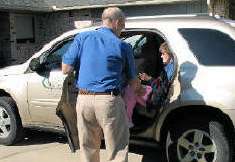 Cerebral Palsy Research Foundation of Kansas, Inc.
Cerebral Palsy Research Foundation of Kansas and Timber Lines Transportation Service provides affordable transportation for people with special needs and disabilities in Wichita . Please call to make your reservations by 4:30 pm 24-48 hours in advance. Please contact them for more information. Victory in the Valley Inc. Victory in the Valley offers transportation to cancer patients for treatment . Please contact them directly for more information.